One of the primary purposes of forming a revocable living trust is to avoid probate. Making a trust isn't all that complicated to accomplish, and you can rest assured knowing that your estate and your beneficiaries won't get bogged down in a court-supervised probate process after your death. You'll also know that your personal affairs will remain just that—private. Your last will becomes a matter of public record when it's submitted for probate. A revocable trust is created by writing a trust agreement. The agreement involves three primary parties: the trust-maker (also called the grantor or settlor); the trustee; and the beneficiary. As the names imply, the trust maker is the individual who makes and funds the trust. The beneficiary is the person who benefits from the trust. The trustee manages the trust and its property. With a typical revocable trust, the trust maker, trustee, and beneficiary are all typically the same person. After the trust agreement has been completed and signed, the trust maker will proceed with funding the trust, which involves transferring his assets into its ownership. He would normally designate the trust as the beneficiary of his retirement accounts, life insurance, and annuities. Real estate is also commonly held in trusts. As trustee, the trust maker will then manage, invest and spend the trust's property for his benefit as beneficiary, and for the benefit of others if he has also named them as beneficiaries of the trust to inherit after his death. The trust maker will not own property in his individual name after his assets have been funded into the name of the trust. Technically, they will be owned by the trustee for the benefit of the beneficiary—himself—or later beneficiaries. Because he doesn't personally own this property, probate is not required to transfer ownership to other individuals when he dies. His trust does not die with him but lives on as a separate legal entity. 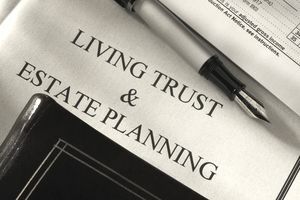 The administrative or successor trustee named in the trust agreement will have the legal authority to step into the trust maker's shoes after his death. He can then take control of bank accounts, investment accounts, and business interests. He can also collect life insurance proceeds, retirement accounts, and annuities, pay the trust maker's final bills, debts and taxes, and distribute the balance of the trust funds to the trust maker's other beneficiaries named in the trust agreement—all without probate and court involvement. Of course, if you form a revocable living trust but neglect to transfer certain property into it—maybe something you purchased long after the trust was created and that you never got around to moving into the trust—this particular asset would require probate. If you don't also have a will, the property would pass to your heirs-at-law—your closest kin who can inherit from you in the absence of a will under state law. One way to avoid such oversight is to create a "pour-over" will at the same time you create and fund your trust. A pour-over can direct that any assets you own outside the trust should move into the trust at the time of your death to be administered to your trust's beneficiaries under the terms of your trust agreement. But any property left outside your trust will still require probate, even if your pour-over will send the property into your trust at your death. You—not your trust—owned it at the time you died, so probate will be required to transfer the assets to someone or something that is still "living." Your best option is to make it a point to transfer all newly acquired assets into your revocable living trust immediately.